Political revolution, struggle and crisis often cast a long shadow over Egypt, but when the sun shines, (and it does ever so often), it illuminates all that is beautiful about this place. Yes, the past few years of struggle and conflict may have erased Egypt off of some travel sites, but it is still very much there, in all its sprawling history and glory. The history of Egypt stands tall and strong; and the past years of civil strife haven’t been able to put a dent in it. From the lively markets that are brimming with colours, to the cascading blue Nile that gives way to the sandy Saharan desert. Egypt is this and so much more. And how could it not be? After all, years of history and time have gone into its making. So while you're busy looking for flight tickets to fly you out there, we take you on a visual tour through the timelessness of Egypt. In the Luxar governorate of Egypt lies an area of ruins. Of decayed temples, chapels, pylons and immense beauty. Karnak is a place with large and complex history. 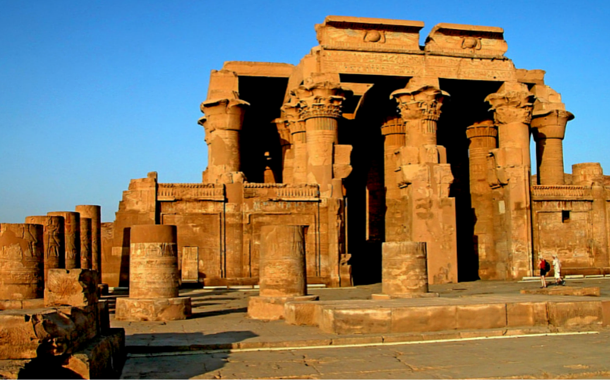 Its construction spanned many ages and took 30 Pharaohs (ruler of ancient Egypt) to build it. This is what makes its size and complexity, something you’ve never seen before. Pyramids have become the symbol of Egypt. These great structures of stones and bricks remain mankind’s biggest mystery. Complex architectural structures, they first appeared in Egypt in the fourth dynasty during the range of Sonfru. In ancient Egypt these pyramids were considered as the tombs for the royal Pharaohs. In close association with the word Pyramids, you find the word Sphinx. Sphinx is a mythological creature with the head of a human and the body of a lion. And sometimes with the wings of a bird. The reason they’re associated with Pyramids is because they act as its guardians. A riddle is posed by the Sphinx and those who fail to answer it are devoured by the beast. Thus the royal body of the Pharaoh stays protected. Egypt is not just all about history. Here the past flows into the present, stopping time in its tracks all together. The Heavenly Church is an example of such timelessness. One of the newest and biggest Coptic church of Egypt, the Heavenly Cathedral was voted as one of the world’s 10 most beautiful churches in 2010. The picture says it all. Egypt is the land of hidden treasures, and one such is Mersa Matruh. With places like the Drowned city of Caesar and the Drowned city of Cleopatra, this town is truly a gem. But the cherry on top of the cake comes in the form of the white sandy beaches and the clear blue water. Who wouldn’t want to visit such a paradise? Camels, blue waters with a glimpse of the pyramids in the distance. If there were one picture to sum up the true essence of Egypt, this would probably be it. Egypt has so much to offer that the words would never end. If you enjoyed this post, let us know in the comments and we’ll come back with more pictures and insights on Egypt.